The faces that I am making in this post pics are priceless. Those of you who follow me on other social media outlets may know that I reside in Jackson, MS part-time, so let me tell you about the heat wave here. The heat is just down-right RUDE. It's sweltering. But I can honestly say that I love it here - 115 degree heat index and all. On this particular day in Jackson, I wore an oldie but goodie. I got this romper on clearance (as I do all my clothes) at Express many years ago. I couldn't have been more happy that this thing still fit after owning it so long, and actually not wearing it for almost 3 years...I had lost it (yikes). Another thing I love about this romper is it's versatility. This outfit can easily go from day to night with a simple shoe and accessory swap. 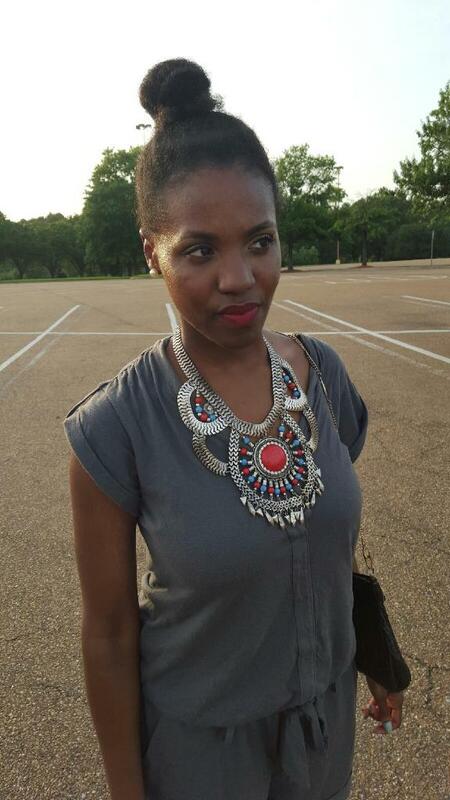 Here I was out about to catch dinner with my babes, so I wore heeled sandals, a red lip, and a statement necklace. He thought I looked fancy.